It is still hot in many parts of the U.S., and heat illness is a health concern, especially for children. The following press release speaks to protecting your child from heat induced illnesses. Doctors at Cincinnati Children’s Hospital Medical Center want parents and guardians to know how they can keep their kids safe during the hot weather. Heat stroke symptoms include hot flushed skin, high fevers (over 104° F), and altered mental states such as confusion. It can be accompanied by seizures. It is a life-threatening emergency, and needs to be treated promptly. Heat exhaustion is less severe, but is still dangerous and requires medical attention. Symptoms include pale skin; profuse sweating; nausea, dizziness, fainting, or weakness. Heat cramps are most common in the abdomen and legs, especially the calf or thigh muscles. Tightness or hand spasms can also occur, but none of these symptoms are accompanied by a fever. • Cool the child off as rapidly as possible while waiting for Emergency Medical Services to arrive. Move the child to a cool shady place or an air-conditioned room; sponge the entire body surface with cool water (as tolerated without causing shivering); and fan the child to increase evaporation. • Keep the feet elevated to counteract shock. 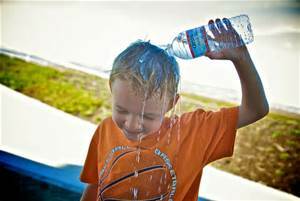 • If the child is awake, give him as much cold water to drink as he can tolerate. • Fever medicines are of no value for heat stroke. • Put the child in a cool place. Have him lie down with the feet elevated. • Undress the child (except for underwear) so the body surface can give off heat. • Sponge the entire body surface continuously with cool water without causing shivering. Fan the child to increase heat loss from evaporation. • Give the child as much cool, not cold water to drink as is tolerable until he feels better. • Move the child to a shaded area. • For persistent or severe symptoms, take the child to be seen by a physician. • Monitor the child’s physical activity and make sure that he does not overly exert himself. • Make sure the child drinks plenty of water and rehydrates often. • Encourage frequent breaks from physical activity so the child can cool down and gently stretch his muscles. Cincinnati Children’s Hospital Medical Center ranks third in the nation among all Honor Roll hospitals in U.S.News and World Report’s 2014 Best Children’s Hospitals. It is also ranked in the top 10 for all 10 pediatric specialties. Cincinnati Children’s, a non-profit organization, is one of the top three recipients of pediatric research grants from the National Institutes of Health, and a research and teaching affiliate of the University of Cincinnati College of Medicine. The medical center is internationally recognized for improving child health and transforming delivery of care through fully integrated, globally recognized research, education and innovation. Additional information can be found at www.cincinnatichildrens.org. Connect on the Cincinnati Children’s blog, via Facebook and on Twitter.